SHEBERGHAN, Afghanistan — The top commander of the Islamic State group (ISIS) in northern Afghanistan stood behind a lectern decorated with the shield of the Afghan government’s powerful intelligence agency. This is how the ISIS commander, Maulavi Habib ul-Rahman, began his “imprisonment” Thursday. Along with 250 of his fighters, Rahman had surrendered the day before to the Afghan government in the northern province of Jowzjan, to avoid being captured by the Taliban. He thanked his hosts and, in a scolding tone, warned them to stick to the deal they had just made. “Provide us with personal security as well as stay loyal to the commitments made between us so it prepares the ground for others who fight against the government to join the peace process,” Rahman demanded from the dais. Peace process? Officially, Rahman, another ISIS commander, hundreds of fighters and 20 relatives traveling with them were prisoners who had turned themselves in to the government to avoid imminent capture by Taliban insurgents who had conducted a monthlong offensive against them. Other insurgents have joined the government side through a formal peace process open to those not accused of human-rights abuses, but that is not a possibility with the ISIS militants, officials insisted. “They surrendered to Afghan forces; they did not join the peace process. These are two different things,” said Gen. Faqir Mohammad Jawzjani, the provincial police chief, who shared the podium with Rahman. If they were prisoners, however, it was hard to tell. The government arranged for them to stay in a guesthouse in the provincial capital of Sheberghan. Guards were posted around it not to keep the insurgents in, but to keep their potential enemies out, according to the provincial governor. Although the fighters were disarmed, they were allowed to keep their cellphones and other possessions. In the guesthouse, the ISIS fighters celebrated their good fortune, hugging and slapping one another on the back. One of their commanders, Mufti Nemat, wearing a pink shalwar kameez and a knockoff of an Apple watch and holding a satellite phone, fielded calls steadily between giving interviews. At their peak, the ISIS fighters in northern Afghanistan numbered as many as 500 followers of Qari Hekmatullah, until he was killed in a U.S. airstrike in April. Rahman and Nemat, who are brothers-in-law, then emerged as the leaders of the group. Nemat said he joined ISIS because he believed in the group’s ideology, which he felt was closer to Afghan values than that of the Taliban or the government. Nemat, Rahman and their followers previously fought on the side of the Taliban and the government before joining ISIS in 2016. The dubious nature of the ISIS surrender has proved a propaganda bonanza for the Taliban, which began an offensive with thousands of fighters about a month ago to wipe out ISIS in the north. All of their fighters have now surrendered, been captured by the Taliban or been killed, according to Nemat and government and Taliban spokesmen. Much was made by the Taliban and by the government’s critics about how the ISIS prisoners arrived in Sheberghan. They were ferried from the battlefield in Afghan army helicopters, avoiding a potentially dangerous journey on the roads. Nemat, was defiant, saying: “The Afghan government promised they wouldn’t punish us. The Afghan government must save my life and provide me with security.” He insisted his commanders and their followers were guilty of nothing other than fighting on the battlefield. “I am ready to go to court if there is any proof against me,” he said. The complainants included Yar Mohammad, 53, a farmer from the Darzab district of Jowzjan province, where the ISIS fighters had their stronghold in the north. On July 24, he said, his pregnant niece, Noria, was shot to death by Rahman and Nemat’s group of fighters while she was visiting the doctor. Five months earlier, his cousin Barakatullah was beheaded by them on suspicion of supporting the government. “We lost everything to Daesh, and now the government sends helicopters for them from Kabul and brings them here and gives them rice and meat and mineral water, and provides them with security, and we are not even able to find food,” he railed. Daesh is another term for ISIS. The governor of the province, Lutfullah Azizi, said any crimes would not be overlooked. “We welcome them if they accept Afghan law,” he said. “But those who committed crimes, if there is any documentation or proven complaint against them, they will be punished.” He added that “hundreds” of complaints had been lodged against them during their years in power. ISIS still has a major pocket of fighters in the southern part of Nangarhar province, in eastern Afghanistan, but concerted attacks on them by U.S. and Afghan special forces, backed up by airstrikes, have greatly reduced their presence in that area. In recent months, they have concentrated instead on launching suicide attacks on lightly defended civilian targets. 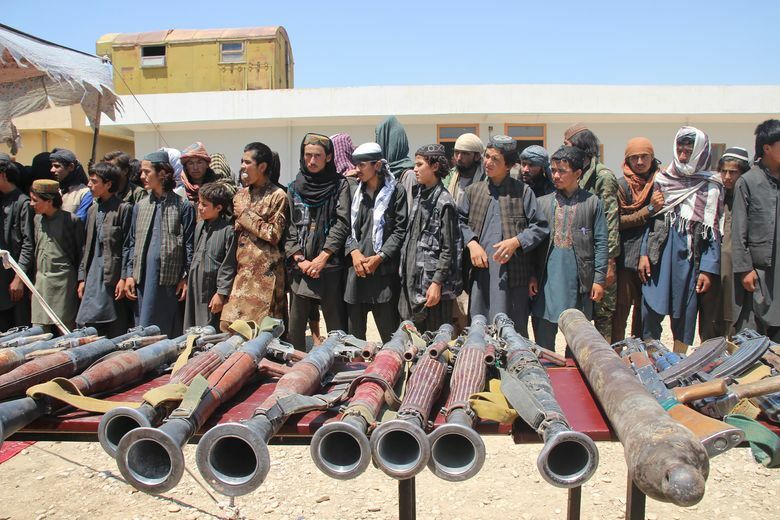 An official with the National Directorate of Security (NDS), the intelligence agency, said the ISIS fighters would be in for a surprise once they were transferred to the custody of the NDS in Kabul.